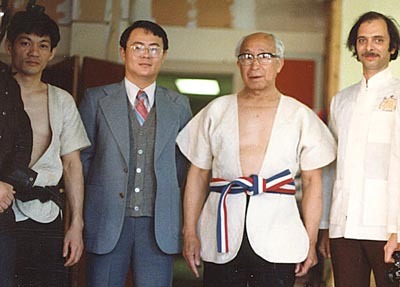 At left, in uniform is Daniel Wang, who wrote the book "Fundamentals of Shuai Chiao" and created a short form of Chang Style Tai Chi. Next man is unidentified, then come Great Grandmaster and Grandmaster. Taken in Ohio, 1984.